Here’s a sample 18 month schedule. See more sample schedules below. Post contains affiliate links. 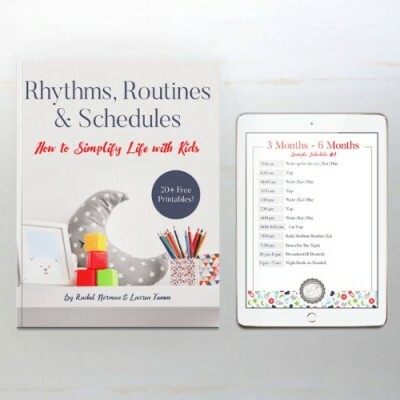 My newborn and 4 children under 4 schedules were a huge hit (and you may want to read my summer schedule for kids) so here’s an 18 month old sample schedule. I have a dear friend who is far more laid back than myself, and she told me even she likes to look at schedules though she doesn’t really keep one! Love the honesty and self-awareness! But honestly, I see the appeal. It’s good to know how others fill their day and what their kids get up to. When you’re home all day with kids it can feel isolating and you begin to wonder if you’re the only one who spends 20 minutes making peanut butter and jelly sandwiches or picking up hundreds of elastic bands because your daughter tried to rainbow loom even though she (nor you) know how to do that. So here’s the basic routine I’ve had all my kids on. 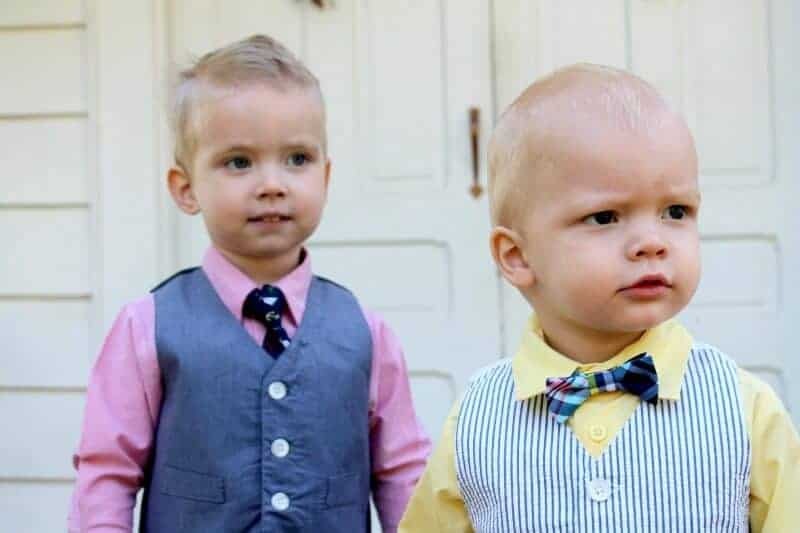 As soon as they dropped their morning nap, around 18 months, they all followed a similar schedule to this until they were 2 years old and even higher. Some babies drop naps a lot earlier than 18 months and some will continue to have two naps. In my experience, I think that 18-month-olds can generally go with one nap, but still need a bit more sleep than their older siblings. 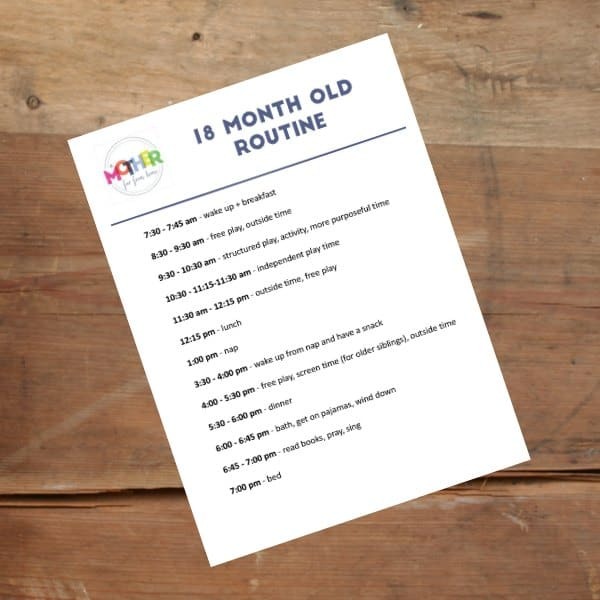 Get your toddler to follow their own routine without nagging by using these printable routine cards. 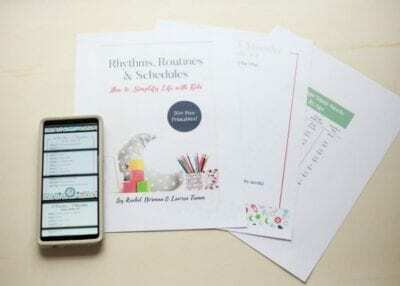 Would you like a copy of this 18 month routine to print and use at home? Sign up below and I’ll send it via email. 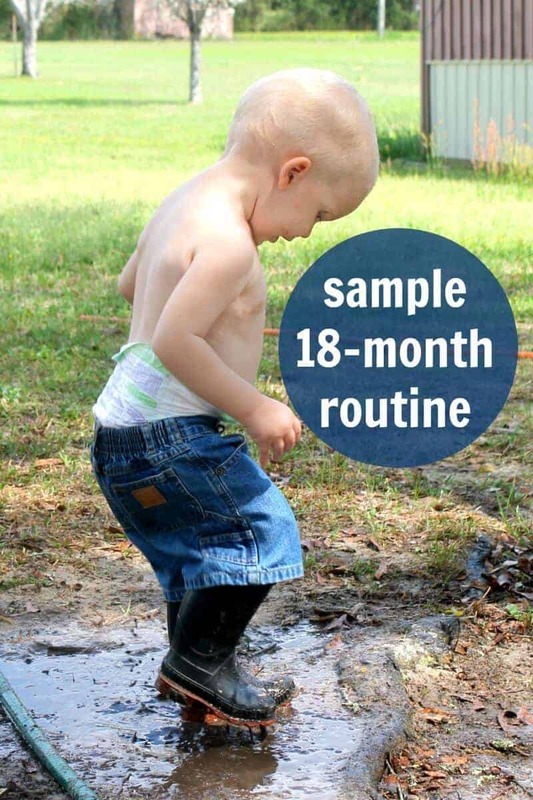 Get 25+ sample routines ages 6 weeks to 5 years AND joint baby/toddler/preschooler schedules right here! I use this term loosely to mean that I engage with the kids on purpose. Sometimes we do our Fruit of the Spirit Preschool Curriculum and other times we color or play with play dough. It could be as simple as lining up pillows and running across them or a specific craft. I don’t take on any pressure or guilt about this, but try to engage them in things at their level they find enjoyable. We live on acreage now so we decided to build a fairly large enclosed area where the kids could play without me worrying they were going to fall into the pond or pool or walk onto the road. Often outside time consists of all the kids playing outdoors together while I am inside working or doing something else. Maybe we’ll play red rover, go water all the trees and plants in the garden, or feed the fish in the pond. I like for them to be outside as much as possible for as long as possible. We have a lot of toys like this that can take a beating and, when used up, thrown away. See tips for toddlers outside. In my 4 under 4 schedule you’ll note we used to watch TV first thing in the morning when I was in late pregnancy and when I had a newborn. It wasn’t ideal, but it was what I needed to happen to cope and that’s fine. Now, with my youngest just turned 3 months, I’ve shifted TV time to after the nap. If you prefer educational games, check out ABCmouse for one month free. This is screen time + learning. Choose a routine that you can maintain every day. One that isn’t too strict nor too lose that the days feel chaotic. Teach your child to follow their own routine. 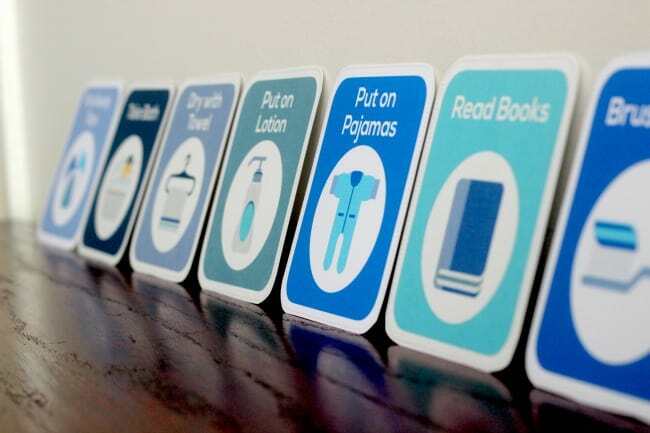 I do this by using printable routine cards as shown here. Be consistent, but flexible. Things like sicknesses and appointments will happen so anticipate them. It can seem very difficult to get started doing or keeping a routine when you do not have one at all. Here are some ways you can learn to keep your routine. 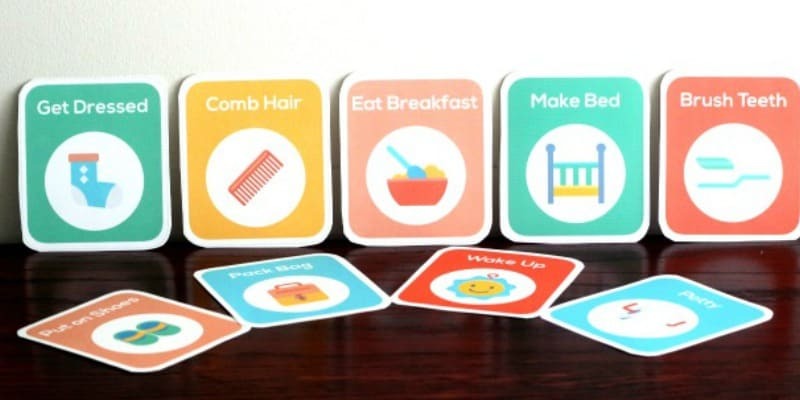 If need visual help remembering the routine and want to teach your toddler to follow the routine at the same time (so you don’t have to nag) I recommend using our routine cards (seen below) or something similar you can whip up at home. You hang them up in the appropriate room (bedroom for morning routine, bathroom for bath routine, kitchen fridge for mealtime routine, etc.) and then use them to help your child learn independence and self-regulation. We can often get so wrapped up in what we’re doing we forget and we’re an hour or two past nap time and now they’re having trouble going down. Want Routine Printables to hang up? We use these in our home and my Kindergartner even uses them to help herself get ready each morning. My son is looking forward to hanging his in his room as well. 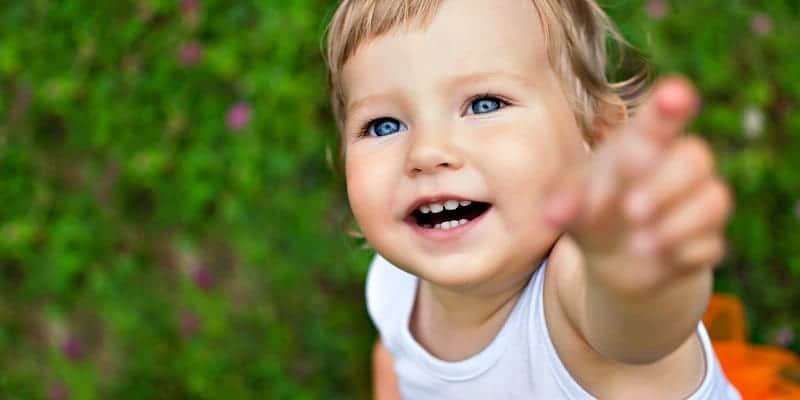 These will help you point out what your child should do without always issuing commands and – you may be surprised – how much more cooperative your child becomes when they can see what’s next. Get your own printable routine cards here! I actually have an incredibly similar schedule to yours! A woman after my own heart! Just a question: do you find they are hungry for dinner if they have a snack after they get up from their naps? I find either mine eats a dinner portion for snack, and then wont eat dinner, or wont eat snack and does eat dinner. What do you think I should do? Also, what kind of portions do you expect the kids to eat at this age? Thanks so much! Olivia, you are so right on about the snack. I try not to give them anything but a small snack because sometimes he wakes up at 4:30 and we eat dinner at like 5 or 5:30 anyway!! As far as servings, I try to plate little so I’m not angry. Ha. Then if he wants more, I’ll give him more! Oh my goodness, am I glad I found you on Pinterest! We are sleep training our 16 month old and let’s just say that the brain isn’t as sharp as it once was. I have been struggling with keeping a consistent routine going (because I am generally horrible at routines even though I try to convince myself that I love them) and very clearly failing. Yours just makes sense! Because my little guy is still taking two naps, I’m, combining your 6 month and 18 month schedule together. Here’s to hoping for routine success! Thank you, thank you! Thanks for the post. I just got three foster children from the ages of 7 months (actually 4 months developmentally), 18 months and 5 years old. THen I have my four kids which are my daughter 10, Isaac is 13 and then 19 and 22 year olds. I am exhausted!! The 18 month old needs two naps a day I am pretty sure. She gets fussy about 10:00 am and starts sucking her two fingers. I dont know when to put her down for a second nap cause then I dont know if she will go down for bed. I just wish someone would come to my house and tell me what to do with these precious children and give me some energy. I signed up for your devotional. I think I am getting depressed and I already overwhelmed with not wanting to even leave the house this summer because of the hassle. Thanks for your prayers and any advice would be greatly appreciated. Also… what do you pack for snack when you go some place that doesnt get crap all over your car? Having young kids is for young people!! I didnt realize that but I am 43 and starting over and I think I might lose my ever loving mind!! Deborah, first of all, what a woman you are for taking care of children who have no one else. God bless you and your family for that. Second, my van is a total nightmare and I just got done telling my mom I wanted to get it detailed after we had our trip to the beach (which will get it more dirty) so I don’t worry too much about the mess because I just can’t control it but still want them to have a snack if we’re going to be in the car a while. As for the napping, have you done my free e-course on sleep? And I agree, I think maybe putting the 18 month old down for a 30 or 45 minute nap around 9:30 or 10 and then again at 1:30 or 2 for a nap will get all the sleep in without messing up bedtime I think. Hello, my son who is 18 months wakes up early at 6 in the morning and takes a nap by 10.30 or 11 to 1 or 1.30..
I’d start gradually moving that nap bakwards if I were you. So instead of at 10:30 for a few days I’d do 10:45 or 11. Then, after a week or so I’d move it back to 11:20 or so. Then, after a few days, I’d move it back to 12. etc. I’d do this until I got the nap to START around 1 so your days are more full and then he’s less tired at bedtime. Do you think that would work? What about giving her an early lunch at 11 then at 11:30 putting her down until 2? Have you tried a 30 minute nap in the morning, then wake him up, then put him down for a full one in the afternoon? I have not. I guess I should try that. It’s so scary to wake him up because more sleep later is never a guarantee with this kid!! Thanks for responding! I have been struggling in trying to let my baby sleep early at 7-7:30 pm . If he sleeps that early he wakes up every time around 2 pm very alert and it’s a struggle to get him back to sleep (usually after a snack and some water and some playtime on bed). And then next day he wakes up at 8-9 pm . He only sleeps through the night if I delayed his sleep to between 9-9:30 and sometimes 10 😱.He seems fine with it and he is a very very active boy. His naps are between 1:00 pm to 3:30-4:00 pm . How can I organize his sleep and get him to sleep early while sleeping through the night . Is his current schedule okay for everyone? I wouldn’t say you *had* to change it if it isn’t bothering you? My 18 month has a very similar schedule but he’s been waking up at 5am in the past few weeks. Any suggestions to encourage him to late in til 6am or 7am? Hi, both of my toddlers, 1.5 yr old and 2.5 yr old, go to bed around 9 pm and wake up at 9 am. The younger is giving me trouble lately and wakes up around 11:30 upset and crying…I’m chalking it up to nighttime weaning, although she was fine with it last week. Now it’s taking my husband and me 2 hours to get her back to sleep. She’s in her crib, but in our room. Any other ideas? Teething or ear aches? ALL MINE acted crazy when teething or with ear aches! I need help desperately I have 3 children 10, 4 and 19 mos and need to implement some sort of routine for them all asap – I’m losing my mind! Dana, have you done my free routine course? It’ll totally help! Hi! I always come to your blog to check routines and get advice! Haha! Any advice for the 18 month old sleep regression? My daughter who slept through the night (19:30-7) and took one long afternoon nap (usually 2 or 2:30 hours) is suddenly having all sorts of problems to sleep. Night wakings, early morning waking, nap time battles, wants me in the room to fall asleep, etc. Did you ever go through that? Please tell me there’s a light at the end of the tunnel! Haha! She had a similar schedule to yours. Thank you! Hmm, when that happened to me I always had an ear infection or some type of sickness. OR they are starving! Could it be those? I’d truly rule those out first. Oh that and upset tummy. I had one with food allergies as well which affected him until we found out. Hope that helps. 9:00-11am – On day care schedule they have a pretty good one. 6pm – Falls asleep? when we don’t want her too.. haha. Up at 7pm or 8:30 – Wide awake..
8:30 – Dinner time I know its late!! ANY advice please let me know! Tina, can you change her schedule so that she naps at 1 and then goes to bed at 7 or 8? I mean can you just set the routine and make it happen. Will she fight it? If so, whta does her “fighting” it mean? My 18 month old naps from 11 to 1. Then at 5 she’s super cranky and tired. I used to let her sleep for an hour and he would go to bed at 10 pm. Tonight she went to bed at 6:30 pm after a 2 hour nap at 11, and she woke up at 8 pm and now is wide awake probably till 11 pm. I can’t win. Christina, I’d probably try to move that nap back to around 1. I think 11 is a tricky time because it means that they wake up and have a LONG time to go until bed! My daughter is already 18 month old and she usually took 2 naps, sleep well through the night around 10 hours and now She is in process to get just 1 nap. She used to have 1 nap for 1 hour in the morning and other hour in the afternoon but when I started a week ago to move the morning’s nap at 12pm and anymore nap in the afternoon she couldn’t sleep 2 hours in a row, she just sleeps 1 hour so I don’t know what i have to do to make her sleep between 2 or 3 hours of nap. Thank you for your time and congratulations for your blog, it makes me very helpful. Hi, I have a 20 month old boy. We follow a similar schedule. Just wondering what is the difference between free play and independent play? He’s by himself so he has no one to interact with but me. It makes independent play time difficult. We’ve only gotten to about 8 minutes! But sometimes when I take him outside he will stay occupied without me for 30 minutes. Would I consider that free or independent play? It is very real for you, Billy. What I wrote is very real for me! I’m going to try this. My sons sleeping schedule is so out of whack and it’s making me so exhausted that I have been so unsuccessful at getting it back on track. I don’t know how or where it went wrong but he normally refuses to sleep anywhere from 2am-4am. He will sleep until 12:30 and then will nap at 4:30-5pm wakes up. Eats dinner and gets his bath and I try to put him down to bed every night at around 8:30 and it’s just not happening. If I do happen to get him to bed at 8:30 he will wake up anywhere from 10:30-midnight and stay up until 3-4am. I’m at a total loss. Not even sure how this happened. One day he just decided he didn’t want to sleep and fought me every step of the way. Hello, my 21 month old has been sleep trained since the beginning and sleeping through the night since she was 2 months old. We have bee have a struggle with her falling asleep at night recently and not sure on what to do. She has been taking anywhere from a half hour to upwards of an hour and half to fall asleep sometimes. It’s more on the upwards when she has had a busy day. I have pushed her nap to later and even her bedtime to later to try to figure it out but I am just not sure what to do anymore. This is her current schedule. Any suggestions? 2:00pm I have to wake her up from nap no later than 2pm because if she sleeps later than she won’t fall asleep at night but I guess I’m having that issue anyway? Where is your sample 12-18 month schedule? You’ve covered every other age range so I’m curious why 12-18 month isn’t covered feed because I’d like to see how you transition from the morning nap time to that hour being independent play time. What do you do when they wake up early from nap time? All of the sudden my 18 month old will not nap for longer than an hour or so but is cranky by 5. Should I start leaving her in there for the allotted nap time and she’ll learn she should nap longer? I have found it’s unrealistic to expect him to sleep a full 12 hours at this age. I would still like to keep a 7 am wake time but my question is, if bedtime keeps getting pushed later and later should I cut down nap time during the day ? I should also mention that we don’t have any wakes during the night. I am over the moon about this because we both get our sleep but that also means that I usually go to bed shortly after he does leaving no more free time in the evening like I had with a 7pm bedtime. Hi, I wish our nap lasted 3 hours!!! But it lasts 1. Any advice? Also when do you do other things… you know like grocery store, gas, errands, laundry etc?